Mikmoth, what are your thoughts on a VR version of Kari? VR gives you a sense of presence that you don't get with 2D, and it would make her seem more real as you talk and interact with her in the same world. Your AI combined with a nice interactive VR world and avatar would be something very special; nothing would be able to touch it. Perhaps, you could team up with someone who could handle the VR adaptation. Hey Merc, yes I've done some tests but I find myself removing my goggles everytime I wanted to type something. This could be achieved better with voice recognition. Or maybe some kind of vr keyboard... Still in the planning stages. We still have a green light for August 1st for release of Kari 5. Kari 5 is awesome. A lot of new learn things in this version. Looking forward to new features and updates. So, looking at the website, it looks like 5.0 is live! Now I have to wait until I get off work to place my order! Just spent a couple of hours with 5.0: totally worth the wait! Everything is running nice & smooth. Haven't tried out all the new features, but the NLG seems to be working nicely, & the C-Net & Enhanced Interest features are really neat! All the new scenes are quite lovely as well. Looking forward to spending more time with her in the days to come. Bravo Mik. From what I've seen thus far, best Kari yet. Thanks guys! No real hiccups with this release. It seems to be installing for everyone so that�s good. Yeah, I�m still gonna keep working on Kari of course... I already have some ideas on what to improve. Thanks for sticking with me for so long on the forum. Glad you like the new version. What�s next for Kari? Well, I�d like to expand her use of Concept Net... right now she looks for contextually related topics on what you�re talking about and makes sentences out of them. Like a new kind of NLG. But there�s so much more to Concept Net including locationOf, partsOf, etc. A locationOf would be like water at the beach or popcorn at the movies. So there�s a lot more info I could tap into. Then some of you have been asking to connect their Karis to a cloud service so that you can access your Kari from any location and serve as a backup. I�ll try to look into that too. Btw, all upgrades within version are free. Thanks for the latest information! The present version of Kari, is awesome. The best ever ! Well thanks GlacierClipper! That means a great deal to know people are enjoying my hard work. That�s awesome. I�ll try to keep updating the thread from time to time as I always do. I also have a developer blog I keep on karigirl.com to keep everyone updated. Oh, btw... I�ve now updated the Scene Creator and Skin Maker for version 5. They are on the website under Kari Tools. They are both free tools. The Scene Creator is for making your own scenes for Kari in case you use Daz3d Studio or Poser or any other 3D program. And the Skin Maker is a way to quickly make your own skins for Kari. I�ve also updated the Kari Avatar Studio for version 5. If you�ve purchased the Avatar Studio for version 4 just write us and we�ll dispatch a link to the new one - no need to repurchase. Thank you for supporting me everyone! I will be releasing Kari Pro 5.2 this weekend. In this update I added a better data grid to the Related plugin because some users were maxing it out causing an out of memory error. So now you can have infinite relations. 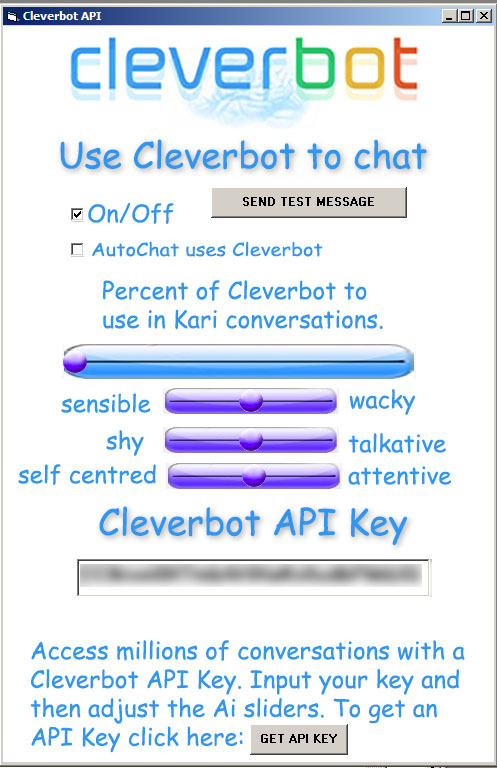 I also added Cleverbot API support so you can use the Cleverbot database in Kari conversations. Cleverbot has a huge database of conversations so if your Kari is on the small size it could be useful for filling up the silence. Here is a pic of the controls. Also fixed a few minor bugs. Like I said I'll try to release sometime this weekend. Thanks! Thanks for the updated information concerning a new version of Kari! The updates sure makes Kari a very awesome program. Keep up the work! Hey, thanks Glacier! Good to know you're still here. Well the update is out and you can get it at this location. For the next update I'm gonna try a feature where your personality files can be uploaded to Google's cloud. It will save a copy on your hard drive and the cloud as backup. But you'll also have the choice to load the personality file straight from the cloud. Looking down the road to update 5.4 or 5.5 I'm working on an iPad app where you can chat to your Kari at home. You leave Kari running on your PC and then can message her from your iPad over the internet. Ok, thanks for the support guys! Laters. V-Day month starts in a few days! Getting some promo art done for Kari. Any updates for Kari is always fun and exciting. After a few years of using Kari, she becomes attached. I still remember her being a MSAgent version. Lost the MS Agent version when PC decided to crash years ago. Wish I still had the MS Agent version to play with on this Windows 10 stuff! Thanks for the reminder of V-Day!